Ballance thy Sword against the Fight. The earlier he gets hooked on Marvell, the longer the reader's life of literary delight. Marvell resides at the very epicentre of the English experience, literary, moral and political, and no one who does not know his works can fully understand the last 500 years of our history. His balance between the two parties of fury is matchless; apart from which his mastery of the English language is miraculous and, yes, I'll say it, marvellous. You scap't the Sea, to perish in your Port. Wish then for that assault he lately fear'd. And o're two Elements Triumphs at once. And the Land owe her peace unto the Sea. A Poem upon the Death of O.C. by Dr John Campbell: "I will add a short Encomium in Verse"
"His Grace the Duke of Newcastle, at Claremont, near Esher, Surrey"
(Larva solet Reges fallere nulla magis). Custodem ut servet, maluit ipse capi. The fittest Mask for one that Robs a Crown. But his Lay pitty underneath prevailed. A Bishops Cruelty, the Crown had gone. 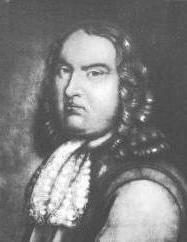 "1673-4: Marvell (code name 'Mr Thomas') operating with fifth column promoting Dutch interests in England, in touch with Dutch secret agents. (Winter)." From John Carey, Andrew Marvell, 1969, Table of Dates. "1674: (summer) Mentioned by Government spies as member of a Dutch fifth-column in England". From Hilton Kelliher, 1978, Table of Dates. "1672-74 War with France as ally against Holland. 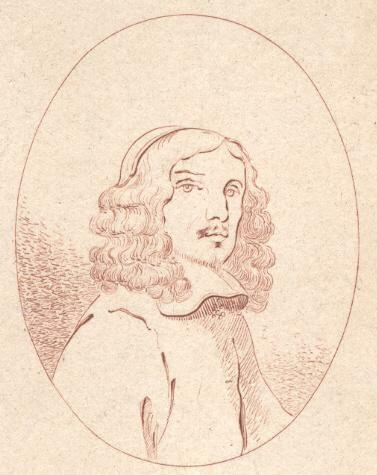 Marvell as 'Mr Thomas' active in Dutch-based, anti-French, anti-Catholic fifth column." From George deF. Lord (ed. ); Andrew Marvell, 1968, Chronology of Important Dates. Nicholas Murray has this to say in his biography of Marvell: "..... there existed at this time a fifth column, described by its historian as 'a strange story of spies and secret agents, smugglers and conspirators, which at times reads more like historical fiction than sober fact'". From World Enough and Time, 1999, p.208. The historian is K.D.H.Haley, whose book is entitled William of Orange and the English Opposition 1672-4, published 1953. His study contains much fascinating information about the roles of Blood and Marvell during these two years. It is a pity that the book ends in 1674, just about the time that Pierre Monamy appears on the scene. Haley suggests (p.65) that Blood's release from custody by Charles II was because "Blood could and did supply valuable information to the government about the activities of the political and religious 'underground' of the time." It seems not unlikely that Blood's enjoyment of the treacherous monarch's favour allowed him to continue his career, but now as a double agent, supplying both sides with selected inside information. Alan Marshall's comment is interesting. He remarks in Intelligence and Espionage in the Reign of Charles II, p 205, that "Blood was working for the greater ends, for a 'cause' ..... stealing the king's crown thus becomes the worthy act of a true commonwealth-man." It seems to me remarkable that Pierre Monamy, towards the end of September 1676 actually wrote to King Charles with a "Petition for release on bail, having been committed, 28 July last, on suspicion of complicity in counterfeiting the Sign Manual and the handwriting of the Earl of Arlington to warrants for freeing foreign-built ships, being innocent and so ill that he can only last a short time." If de la Marche is to be believed, Monamy had turned over about �3,300 in his forged warrant business, and according to a website (here) that sum would have the purchasing power of about �310,000 in UK currency in 2001. His illness, and claim to be innocent, can be taken with a large dose of salt. As he was quite clearly released and not subsequently prosecuted, it appears to me that we have here a carbon-copy of the resourceful Blood. Both Blood and Monamy might, of course, in certain quarters, be regarded as "a knight-errant of civil and religious liberty" to quote G.L.Turner, whose opinion of Blood is cited by Haley. This certainly goes for Marvell, also deeply involved in spying, smuggling, and the production of widely circulated anti-Stuart propaganda. An informer's report to Williamson, 21/9/1671. "It tends to prove that Bl[ood] and Marvell were in touch as being both agents 'from Bucks'; ie the Duke of Buckingham." From Margoliouth's Andrew Marvell, Vol I, p 379. Hilton Kelliher expands this note slightly, p.103. In 1674 Buckingham impeached the Earl of Arlington. Williamson got his job. Pierre Monamy's name occurs in context with Blood's in the Calendar of State Papers Domestic. A Mr Blood makes his appearance in the pages of the Papers in 1678, conversing with de la Marche, an informer against Monamy. It seems Blood was in the Gatehouse in 1678 (DNB), perhaps in company with de la Marche. Payne is also a name that re-appears. Andrew Marvell died on 16th August 1678. It was strongly suspected that he had "suffered under the effect of poison" (Dove, p.65). Perish the thought; which was nevertheless no doubt firmly believed for at least the next 150 years by all those who saw him as the British Aristides. If Marvell's features ever resembled those of the youth above, the liberal refreshments imbibed by his muse had taken effect by the time the likeness to the left was painted, c. 1658. Blake was perhaps not as handsome as shown on a recent stamp; but that he was ever quite as ugly as the print on the right may also be doubted. 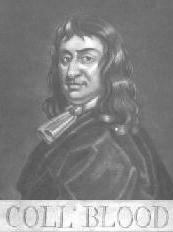 William Popple's epitaph of 1764 claims that Andrew Marvell, like Robin Hood, was "Belov'd by Good Men, fear'd by Bad." The same might be said of Robert Blake, which is why in 1661 his body was dug up and removed to "a pit in St Margaret's churchyard". To the left is the miniature of Robert Blake, General-at-Sea, c.1645, on which the stamp portrayal appears to be based. The engraving above right looks as if it could have been produced by one of Horace Walpole's hack engravers. But it's a bit too early for that. ° ancient Rights: "pace Wilson, these rights are those of the ancient monarchy, in which Cromwell has no part." Margoliouth: p.299, comment on An Horatian Ode. By about 1674 Marvell had firmly concluded that there were other rights, when Adam delved and Eve span, even more ancient than those of a hereditary sacred monarchy. ° cause no Ill: Marvell was not to know that the gold had been off-loaded, and was on shore. ° Caesar: 'Marvell's Cromwell perhaps doubles the parts of Lucan's Caesar and Pompey'. (Syfret). Margoliouth; p.301. Campbell is saying that Blake was nobler than Cromwell. ° Semper Honos etc: "Always thy honour, praise and name shall last." The passages culminating in these words have, I believe, their ultimate origin in Virgil. Their repetition by young P.M.Cornwall may be purely coincidental, but the suspicion that they are in fact a hopeful and semi-coded message to Newcastle is not allayed. Portrait of Blake, Wadham College, Oxford. Is this piece what it seems, or does it want deciphering?